If you had to wear traditional metal braces yourself as a kid, you probably remember dealing with annoying o-shaped rubber bands called “ligatures” that sprang off at the worst possible times. They tended to gunk up with food as well, making it tough to clean your teeth and gums. Thank heavens those days are gone. Our available metal braces in Harvard, MA and Lunenburg, MA, look small, sleek, and jewel-like. 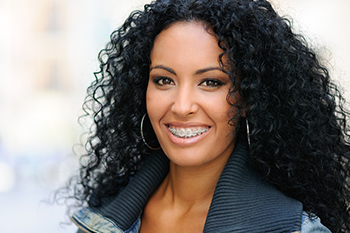 You’ll sometimes hear people call them “tie-free braces.” We also sometimes refer to speed braces as “self-ligating brackets,”which is a fancy way of saying “self-binding.” This technology allows the brace’s arch wire to slide back and forth freely, using a “door” to secure it. Because of speed braces, we can finally say goodbye to railroad tracks, erratic rubber bands, and painful metal tie wires! At Walker Orthodontics, we use Clarity self-ligating brackets. These advanced metal or clear ceramic twin brackets use a special built-in clip. Specific kinds of arch wire apply pressure to activate this clip, which then delivers just the right amount of pressure to each tooth. With this precise pressure technique, you’ll notice fast, highly targeted results. You don’t need to remember these specific details about how speed braces work, though. Leave the “how” to us, and focus instead on what you gain. With speed braces in Harvard, MA and Lunenburg, MA, you will need fewer orthodontic adjustments, leaving more time to do the things you want. Ready for a free initial consultation? Give our orthodontic office a call at 978.345.7988 to set up an appointment. You can also request an appointment or simply reach out for more information with our online appointment request form.